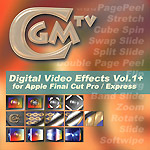 The "CGM DVE Vol.1+" is a set of 38 filters and transitions for use in Final Cut Pro and Final Cut Express. In addition to the professional plug-ins, the package also includes a series of Final Cut Pro workshops and 68 softwipe patterns. Cross Dissolve is always smooth because the transition isn't just linear like Final Cut. What's more, the Film Dissolve uses full-frame steps - just like a real film dissolve. Cube Spin is a truly amazing 3D transition! Look at the 3D shadow and the high quality scaling and you'll see why this effect has been used in several recent movies for the big screen. Zoom/Rotate not only works much faster than the FCP version but the motion is always perfectly smooth! All you have to do is set the end point of the zoom plus the amount of rotation and our plugin automatically calculates the "ease-in" rate. That's not all: CGM's 3D-shadow - unlike the FCP version of the effect - does not rotate with the image but stays in place. Using our 4-Point Garbage Matte video filter you can control the position and softness of each edge separately. The final mask is always smooth and perfect. The updated video filter Brightness-Contrast gives you additional control of your settings. Color Balance now uses bezier curves instead of straight lines for the color correction. Visual control of the bezier curves displays the settings for each color separately. This tool is available as video filter and video generator. It allows you to take a standard 4:3 video and mask it to a number of standardized cinema shapes.